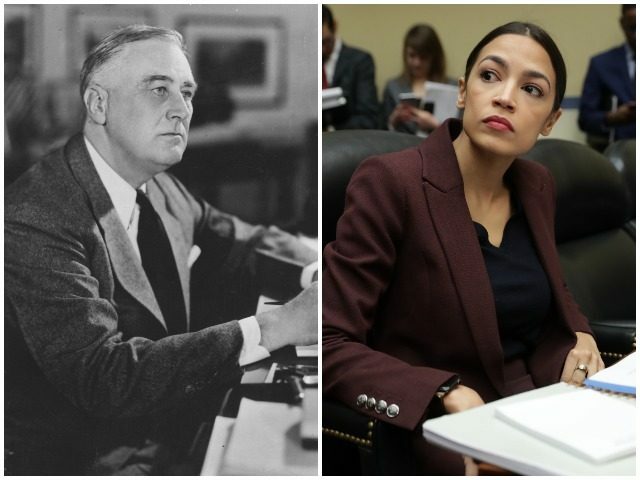 Rep. Alexandria Ocasio-Cortez (D-NY) is spreading the conspiracy theory that Republicans amended the Constitution to stop President Franklin Delano Roosevelt from being re-elected. When our [Democrat] party was boldest, the time of the New Deal, the Great Society, the Civil Rights Acts, and so on, we had and carried super majorities in the House, in the Senate; we carried the presidency… They had to amend the Constitution of the United States to make sure Roosevelt did not get re-elected. First off, she’s conflating two different time periods: the Roosevelt era and Lyndon Johnson era — Roosevelt’s New Deal and Johnson’s Great Society. What’s more, she is insinuating Democrat super majorities are why the Civil Rights Act passed, which is demonstrably false. Although fewer in number, a larger percentage of Republicans than Democrats voted in favor of the Civil Rights Acts of 1964. Secondly, “they” (i.e. those filthy Republicans) cannot amend the Constitution, only “we” can, and this was especially true during the Roosevelt-Truman era when the Republican Party lived in the wilderness. A Constitutional Amendment can only be ratified after two-thirds of both houses of the U.S. congress and three quarters of the states approve it. That requires a broad national consensus that stops any “they” from shoving an amendment down our throats. Ocasio-Crazy’s most shocking ignorance, however, comes from the utterly whacko idea that “they” amended the Constitution to stop FDR from being re-elected. The only thing that stopped FDR from being re-elected was his death on April 12, 1945 — and his death occurred during his fourth term as president just a little over a year after this third re-election. The 22nd Amendment of the Constitution that restricts a president to serving two terms did not go into effect until 1951, five years after Roosevelt’s death. To further prove this amendment was not retaliatory or partisan, it did not apply to Harry Truman, the man Roosevelt chose to be his vice president in 1944 and who was the sitting president when the amendment was formally ratified. In other words, the Roosevelt-Truman administration, which began in 1933 with Roosevelt’s first term and ended in 1953 when Truman chose not to run again, could have legally lasted another 20 years, until Truman’s death in 1972. Now, during the 1944 presidential campaign, Republican candidates Thomas E. Dewey and Wendell Willkie did make an issue out of Roosevelt running for a fourth term (Willkie won the nomination and got shellacked by FDR) and even talked about a constitutional amendment. But even if this is what Ocasio-Crazy is referring to, it has nothing to do with amending the Constitution to stop FDR from being re-elected. Ocasio-Crazy spewed her crazy while appearing on a MSNBC town hall event with Chris Hayes, who did not correct or challenge her.